Ludger Wirsig, an extraordinary keyboard player, living in Potsdam and Andy Robson are collaborating in music for almost 15 years now. Within these years Andy performed on and off as a member of the “Ludger W. Trio” . The bands musical focus is soul and funk from the 60ties and 70ties. 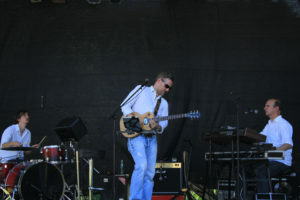 Depending on events and settings they also offer blues and jazz. The ability to produce the sound of a 5-member-band is this trios special feature. Not only is Ludger Wirsig an outstanding pianist and organ player, he also masters the art of “left-hand bassplaying” on the keyboard. A special sound module provides the true rich clay bass-sound, therefore the trio does not need a bass player. Andy Robson resumes 2 parts of a band with vocals and guitar. An alternating high-class drummer completes the trio. So you can book the band for smaller events and stages, where a trio is beneficial. Fans of soul, funk, blues and jazz will still enjoy an impressive atmosphere.